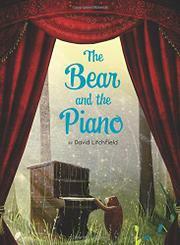 In the forest, a little bear discovers an object he’s never seen before—a piano. At first the cub isn’t sure about the strange device, but over time he comes to love the instrument and the music. The other animals in the bear’s forest home delight in his talent, but he dreams of bigger things. When the opportunity comes to play in the city, it’s a hard decision, but off he goes, and stardom awaits. The bear becomes famous beyond his wildest dreams. He finds great success, but eventually he comes to miss his home. He returns, nervous that his friends may be angry with him for leaving, but instead he finds the entire forest beaming with pride for all he has accomplished. This is one of those rare books that children can return to again and again through the years, each time finding new meaning appropriate to their varying ages and stages. In the emotive, whimsical illustrations readers will sense the bear’s hesitation to leave the forest, his exaltation at playing in grand concert halls, and his longing to return home. The forest seems to sparkle on the page when the bear returns to play for his friends once more.